Located in the heart of charming downtown Dunedin, we are not your typical barbeque joint. Our unique menu boasts dishes and sides inspired by the classic BBQ staples. We pride ourselves in using the freshest ingredients, and all of our sauces, dressings, and side dishes are made from scratch. Listen to local bands, play trivia, and watch sporting events on any of our 11 TVs. Bring your four-legged friend to our large front patio along Main Street. Our rotating craft beer list features many of the best Florida craft breweries. 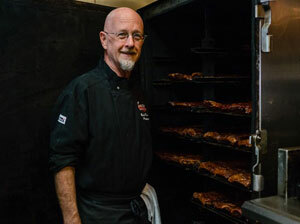 We invite you to come on in and chow down on some of the best, finger-lickin’, lip-smakin’, better not wear a white shirt, smokin’-good BBQ in The Bay! We are passionate about barbeque and making our guests feel right at home. The team at The Dunedin Smokehouse takes pride in our business and it shows. Sit at our bar and enjoy a cold one and some friendly conversation. You may arrive as a first timer, but our goal is to make you miss us and want to return soon! Thank you to our customers and supporters, we appreciate you more than you can imagine. ​Owners, Marti and Tracy Moulson, knew they wanted to be apart of The Dunedin community as soon as they stepped foot on Main Street during one of the Arts & Crafts festivals. 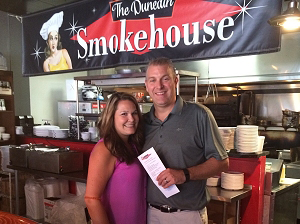 The Dunedin Smokehouse was the first place they strode into and they instantly enjoyed the vibe and fell in the love with the food. 3 ½ months later they were the proud and eager “new” owners. They always wanted to own a restaurant/ bar of their own, because they wanted to put their hard work towards something they would be proud of and could eventually build. They wanted the opportunity to work together on something they would be passionate about, and also have the opportunity to give back to the local community. With the help of an amazing staff, the transition has been smooth, and they could not be more pleased with their decision to leave Las Vegas, move to Florida, and purchase the best BBQ restaurant in town! 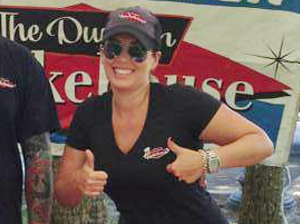 Melissa LaViola has been with the Smokehouse since its inception over 8 years ago. Melissa left her 10 year Career in the cosmetic industry to pursue a new path, in her time at the Smokehouse she has created many successful events including the Rockabilly Revival and Grilling for the Garden. She also loves working within craft beer community and with local charities including HEP. With Marti and Tracy at the helm, Melissa hopes to take the Smokehouse to the next level and open a new location!